4 minutes to read ★★★★★ A genuine eye-opener in a category of its own—and an indispensable tool for anyone who wants to use real science to decisively argue for God’s existence while dismantling neo-Darwinism. Seldom has the hand of providence been more evident to me than in the life of Perry Marshall. His eclectic expertise has uncannily suited him to write a ground-breaking book on evolution that will be equally shocking to both atheists and Christians. As a Christian himself, he has a dogged focus on knowing how God has made the world—on knowing what is true—in the best tradition of science’s founders. This means he is fair and honest in his treatment of evidence which most people find difficult to assess calmly. As the man who wrote the book on Ethernet, he is perfectly suited to discuss the characteristics of code and digital language. Thus he ably demonstrates the one-to-one correspondence between DNA and computer code. As the world’s leading AdWords expert, he has first-hand experience of a technology which mimics key genetic mechanisms, including transposition and natural selection. So he has a unique perspective on explaining these complex evolutionary systems using clear and understandable illustrations. As a copywriter and marketer, he is skilled at crafting an engaging and persuasive narrative. 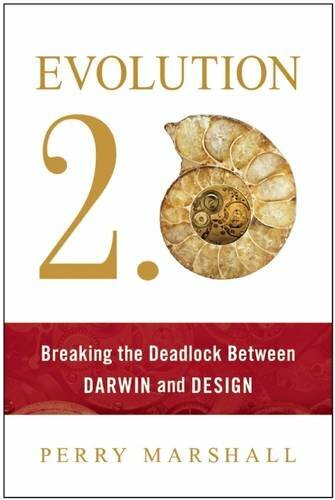 Evolution 2.0 weaves seemingly dry, technical, even incomprehensible topics into a tight, fascinating story that fits around Perry’s own scientific and spiritual journey—revealing along the way empirically validated and truly astonishing facts about what DNA is and how it works. These are facts that, with no exaggeration, turn mainstream evolution on its head. Perry persuasively proves that evolution not only occurs, but that it occurs far more rapidly and successfully than neo-Darwinists expect, because it is not a blind, random process that relies on lucky mutations over millions of generations. Rather, it is an intelligent, goal-seeking process that can produce radical new designs in even a single generation. He demonstrates beyond doubt that the development of new attributes and species is a staggeringly sophisticated system, directly comparable with computer code and languages…only far more advanced. He documents how organisms can acquire new code from others via a common language; predictively reorganize it on the fly to create new functionality; selectively enable or disable parts of it to change characteristics in response to environmental pressures; and even combine code with other organisms to create a new species. All of this is extensively referenced for readers who want to verify his claims, or just learn more about the amazing capabilities of DNA that have been discovered—but not publicized—in the past 50 years. Perry also suggests a convincing, experimentally-tested mechanism by which genetic information can increase over time—thus laying a foundation for plausibly explaining the Cambrian Explosion, as well as the development of irreducibly complex designs. The picture he paints of DNA is of a genetic programming language so advanced that its programs can intelligently communicate with others and upgrade themselves repeatedly, even writing entirely new programs—all without crashing, without losing data, and while fitting their code into a space 30,000 times smaller than our best hard drives. The greatest nerds in computer history couldn’t even guess about how to start imitating these features. Which begs only one reasonable explanation about its origin: an extraordinarily brilliant designer. But Perry’s focus on scientific data does not come at the expense of discussing other critical issues. Unlike certain other popular books on science and religion, which shall remain nameless, he ably canvasses key issues like the hard problem of consciousness, the philosophical underpinnings of science, the show-stopping presuppositions of neo-Darwinism, and science’s history with faith. Although the chapters on these topics are brief, he handles them well. He is commendably straightforward, and presents the central ideas clearly—even to people with no prior knowledge of them. Any Christian who cares about how creation glorifies God—and how evolution is actually an apologetic arsenal waiting to be unleashed on neo-Darwinists—should add Evolution 2.0 to the extreme tippy-top of their reading list. Evolution occurs, it occurs rapidly, and it is intelligently designed to be inventively goal-seeking in ways we are only beginning to understand. A note for clarity: I remain highly unconvinced about the earth being ancient—thus I don’t agree with Perry on the extent to which modern life can be traced through evolution to a single-celled common ancestor. Nonetheless, I find his overall presentation absolutely compelling. See my comment directly below this review, and also my clarification on the Evolution 2.0 Facebook page. Since the auhor is no creationist, may I assume that you aren’t either? i just like knowing where peopel are coming from. The argument Perry makes is really geared to anyone who is interested in evolution and design; it isn’t really about creation. I believe Perry is a theistic evolutionist himself, but he did not persuade me of theistic evolution. Rather, he persuaded me that DNA is a code which functions like a highly sophisticated computer program and is very obviously designed by someone vastly smarter and more knowledgeable than any human. I wouldn’t think that any informed young earth creationist would find his conclusions problematic. On the contrary, as someone who leans toward YEC myself, his conclusions supported the view that there must have been a rapid explosion of species from the created kinds in Genesis 1—an explosion that couldn’t occur using a slow, “buggy” mechanism like random mutations. A YEC would go into this book expecting that DNA works quite differently than an atheist believes—and he would find corroborating evidence in spades. The difference in opinion between Perry and me, or theistic evolutionists and YEC in general, is in how you combine the nature of DNA with beliefs about the age of the earth and how the fossil record should be interpreted. “Smart” DNA + ancient earth + traditional fossil record tends to lead quite naturally into theistic evolution. “Smart” DNA + young earth tends to lead naturally into a robust creationism. I don’t have a settled opinion on the age of the earth, mostly because I don’t know what “age” is supposed to mean. I don’t understand the argument that says God cannot create a mature creation 6,000 years ago, for example—and I don’t know how to measure the age of such a creation if he did. If he created a 4.3 billion year old earth 6,000 years ago, does that make the earth 4.3 billion years old, 6,000 years old, or 4,300,006,000 years old? Seems like a case of asking the wrong question. I actually think one of the key strengths of Perry’s book is that, while he states his view on the age of the earth, and argues from starlight that the universe must be ancient (which is a good argument), he doesn’t get sidetracked in speculative reconstructions of past events. He doesn’t say, “This is what it looks like happened X million years ago.” Rather, he focuses very strongly on what does currently happen. What does DNA do now? What can we conclude from that about its origin? And then, with that foundation of hard science—nothing like the just-so stories of the evolutionary narrative—he says, “How would this apply to things like the Cambrian explosion?” And he gives a realistic, plausible mechanism for that. But of course, you don’t have to interpret the fossil evidence to point to the Cambrian explosion to benefit from the hard science that comprises the real point of the book. So a YEC can accept and use all of his DNA evidence to crush the secular view of evolution, even if he has to also defend his view on the age of the earth while doing it. Or he can just grant the age of the earth for the sake of argument, and show that DNA needs a designer and couldn’t possibly be a product of natural processes acting mindlessly and mechanistically. What do you mean by God creating a 4.3 Billion year old earth 6,000 years ago? Are you referring to something like Opthalmos? In that case all science is simply a pragmatic tool? I don’t necessarily see a problem with that, but isn’t Opthalmos kind of ad hoc? I’m not saying Omphalosism is true; just that I don’t see why it cannot be true. The scientific critique that it is unfalisifiable strikes me as irrelevant. Empirical falsifiability is not the criterion for knowing truth. And the religious critique that it is deceptive strikes me as misguided. We can be mistaken about the way the world is because we made bad assumptions about how God went about making it; not because God intended to deceive us. Incidentally, I don’t think this reduces science to a mere pragmatic tool; it simply puts science in its proper place as a secondary truth-discovery method. o accept. Maybe it is a psychological thing, but yeah…Is that something we would want to say? Well, geologically the rate accumulation of certain natural and artifactual material puts a severe strain on Young Earth Creationism. For instance the abundance of stone tools that would have had to be created in a short time after the flood that has been found in North Africa, on the natural side of things it is hard to see how so much sediment could be present in certain caves where possible human ancestors are found, and where they aren’t found. (Dr. Duff has a good run down on the evidence of one cave, but there are numerous cases with the same evidence. http://thenaturalhistorian.com/2015/11/11/a-strange-testament-to-an-ancient-earth-bat-breath-causes-caves-to-grow-larger/). For me, I want Young Earth Creationism to be true. I just have very low confidence that it is. Thanks for your time. Not having done the reading you have, I’m underqualified to answer your questions. For example, I’m not aware of the flood being poorly-attested geologically; I was of the impression that if you work with the assumption that the biblical record is accurate, the flood is quite obvious geologically; but if you work with the assumption that the earth is ancient, that geological evidence gets reinterpreted quite drastically. There’s also the question of the historic record. If the flood was the kind of catastrophic event the Bible depicts, we should have left its mark on the historic record as well. To the best of my knowledge, it did; widely separated cultures have oral traditions of a great flood, with details that are hard to explain in terms of mere local flooding. I think it’s totally reasonable to have trouble with civilizations not actually being real. I can’t see how extending the Omphalos Hypothesis to entire cultures makes sense. Why would God create records of non-existent people? That seems categorically different to simply creating the earth old, and then creating people on it. I do take the flood traditions seriously though. I am reading a couple books on mythology, and there are some parallels from non-Mesopotamian cultures that should make anyone scratch their head. For instance (I can give you the reference later) in a Greek myth there is almost the exact phrase of a woman crushing the head of the serpent, there are Native American legends about a great deluge with a family being preserved from the waters, etc. I have a hard time finding books that deal solely with the flood myths though. It would be helpful to have someone write a book, like Winifried Corduan did about original monotheism, about the universal flood legends. Anyway… hope you are a well. The flood narrative has separate purposes from what many in the science field would consider. It is a story of faith of a man in the absence of evidence. A story of a man who has a strong faith, but also real weakness. Noah is a real character, at times larger than life, then at times just like the rest of us. It is a story of redemption. So that the extent of the flood is secondary. God commanded Noah to build an arc to rescue the people and beasts that God wanted to preserve. Noah did and was rescued. The world of Noah was violent and perverse. And that civilization was wiped out. And you are right Dominic that the audience probably had very little contact with people from afar that may have contradicted a worldwide flood. The silk road wouldn’t be in full use until many centuries later. And there were still remains of an arc in Turkey in Jesus’ time. And that was enough evidence for the contemporaries of Jesus to not feel the need to contradict him. Even if the remains of the arc may have been 1500-2000 years old at that time or even older. Elements in Greek mythology are rather outlandish but may be related to what was happening in this realm before the flood, and in that context there may be something to those as well. Not that I believe in a Medusa, but a woman with some wild looking hair could have tortured her subjects. There are no limits to human fantasy, and the capabilities to embellish around a core of truth..
Based on my own Bible study I am no longer completely convinced that the flood had to be a global catastrophe. In several places, the Bible refers to the World and it ignores the areas outside of the Near East and Middle East, namely China, much of Africa and obviously Americas, though often including the Mediterranean. In that view, would a flood in the area of the Mediterranean / Black Sea / Caspian Sea be a reasonable area to focus on? If these areas were drier because of the ice age and the sea levels in the oceans lower, could the possible barriers of Gibraltar and or Bosporus have given way in a storm that would have caused a massive flooding of these previously dry plains? Hey Joe, I don’t have a very considered opinion on that. Exegetically, I think it’s possible the flood was local. However, I’ve heard arguments that a local flood in Mesopotamia wouldn’t be sustainable for so long due to the topography acting as a natural drainage mechanism. On the other hand, you have to explain the presence of difficult facts like marsupials in Australia. Presumably Noah didn’t have any of those on the ark. Either way, it seems to me the point of the flood narrative is not to precisely describe the geographical boundaries of the flood, but rather to emphasize that it destroyed all people except for Noah’s family—with the possible exception of some Nephilim. My concern would be with a view of the flood that preserves that key intent, rather than trying to preserve geographical information which the authors and audience probably didn’t have any knowledge of, nor concern for.